The High Definition Magnetic Resonance (HDMR) scanner provides physicians with highly detailed pictures of anatomy and pathology to help them evaluate a wide range of patient conditions, including stroke, musculoskeletal, and heart disease. The HDMR provides optimal diagnostic capabilities for the assessment of the brain, spine, prostate, abdomen, and pelvis, as well as perform orthopedic procedures on the elbow, wrist, hip and ankle. The new HDMR is the most powerful MRI scanner available to patients in the Central San Joaquin Valley. This translates into our ability to provide the highest level of care available for patients in need. 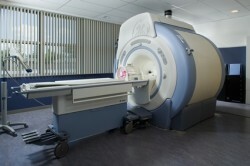 You will be comfortably positioned on a special table that slides into the MRI system. The technologist will perform the MRI sequences at the control unit in an adjoining room. You will be able to communicate with the technologist by means of an intercom, and music or earplugs will be supplied for your comfort. An MRI does not cause any pain, but you may find it uncomfortable to remain still during the examination.